Emil from VELONODE just asked us for some tips to create a team. Here their post. It is in our opinion, one of the most interesting topic for AMATEUR cyclists. Cycling is like a team game (if we can call it game) even you can ride alone or race alone. Cycling in group is always better experience, even you are racing, training or just routing. We can give you some tips from the experience to creating COMM FIXED TEAM that worked for two years and got good sponsors, but from our side, we are going to focus on the apparel and design inside the process of creating a cycling team. 1. How many boys/girls of your team are going to be really committed? 2. What is the message you are going to throw to the world? 3. Context in which you are going to race? 1. Unity is power. "But there is always a optimized number of member of a operative team. It is usually depending of what kind and level of races are you going to make, but less than 3 riders is not really a team. More than 5-6 riders carries always a bit more complicated management." * A sponsor for apparel is much more easy to get for 3 or 4 riders than 8. * You have to delegate the design process to one or two riders as maximum. If is the brand who develop the design, they have to be revised for one or two riders. Too many people reviewing the design takes time. The creation process need to bae fast, stretching this creation time turns off impulse and momentum. * Always stay together. Both before, during and after races. While competing, the images of a cohesive group of riders empower the team and call for attention. 2. Did you got already a motto, inspiration and goals¿? "For us here in WO, this point is the most important because it gives us the key for the kit design. Good designs give a message that the team can pass on. The key element of the design should be born out of an authentic feeling. It could be a cool/crazy inspiration, a classic inspiration, a super racing inspiration… but always with the team feeling." We have created several “corporative image” for the team, alwaysbefore created the kit design. A shield, a naming, a lettering, etc... everything counts. All that component must work in same direction (together or separated). TOPANA Team, for example (we made past year). Topana is almost an acronym for the sentence: Todo para nada (which is literally all effort is for nothing) that is an expression for: Training a lot, but it is useless. 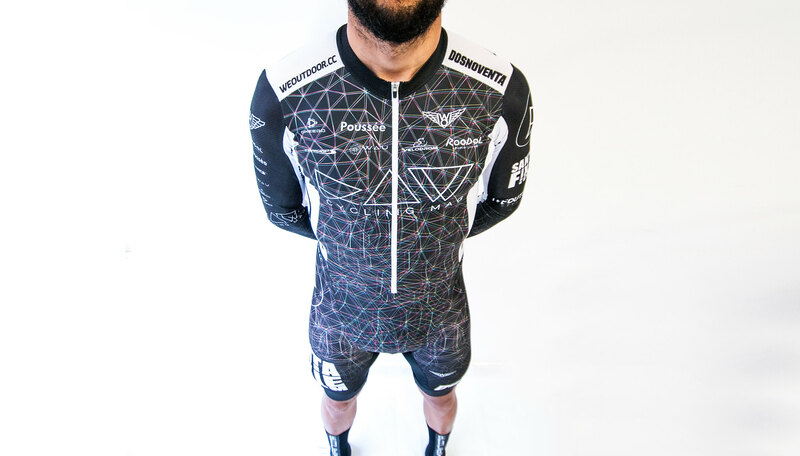 "The club gave us their complete trust in the development of their new Team Image of the amateur road team: Their image was created from a feeling they had, that training can be useless because sometimes competitive cycling isn’t always a level playing field." BRANDING DEVELOPING + Read HERE the whole corporative proyect, or see HERE more pictures from this energy design. 3. Think about your racing context. "Your discipline determines the products: regular kits, speed suit, skin suits with or without pockets, etc. Think about the context in terms of LANDSCAPE, LUMINOSITY. Research what the races look like; do the riders go in a peloton, by themselves, in straight lines etc? What weather and light levels do they race in? Those are all key factors that should shape your design. If you are racing in Red Hook Criterium the design has completely different requirements than those of a mountain bike racer”. “To be visible in the Red Hook Criterium, you need light colors to battle the context parameters: night racing with low luminosity, riders usually racing in straight lines, lot’s of background information (sponsors, spectators, colours) camera flashes etc)”. Don't hesitate to contact us if you are interested on a custom project.